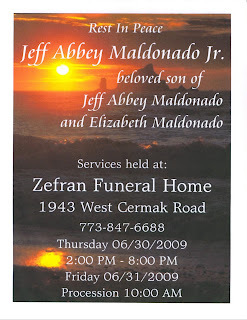 Fundraiser for Jeff and Elizabeth Maldonado, due to the tragic death of their son. Friday July 31, from of 7:00 p.m. - 11:00 p.m.
Funeral services will be at Zefran Funeral Home on 1943 West Cermak Road. Thursday July 30, between the hours of 2:00 P.M. until 8:00 P.M. and On Friday the procession will be at 10:00 A.M.